This is so very, very true, as I'm learning. I finished my Week 1 Couch to 21K training today. It was increments of run 1 minute, walk 2, for 3 miles. Did it in 45 minutes, which is a 15 minute mile. Not too bad for a beginner. 1. Appropriate clothes and shoes are a must. I bought "official" workout clothes yesterday. They are snug fitting and easier to move in. The quick dry, wicking fabric really helps. I'm training for a freaking marathon. Some were chosen for the beat. Some were chosen because the lyrics make me smile. Some were chosen because the lyrics encourage me. The Murphys are mandatory for all workout playlists. 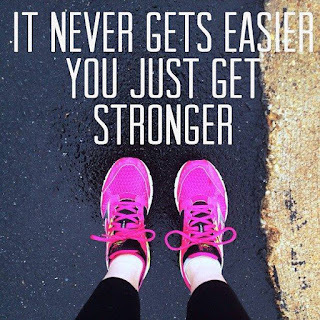 Katie - it doesn't get easier, you get stronger. Romona - chew gum, it helps keep your mouth moist. Dawn - military cadence chants help you breathe right. Connie - pick up the pace and keep going! Melinda - knowing she's training too helps! Thanks to all of them for making this first week a success. then I agreed to a marathon. What was I thinking? Rest days and no-exercise days are schedule for a reason. Running only on Mon., Wed., and Sat. will take getting used to. Horseflies are apparently immune to Deep Woods Off. Everything sunburns but my legs, where I WANT color. Found some organic hydration powder that is awesome. In 19 weeks I'll be able to run a 21K race. In 19 weeks I'll be able to run 13.1 miles.